Veterans know about Veterans Day. Mothers know about Mother’s Day. Lovers know about Valentine’s Day. Why don’t doctors know about Doctors’ Day? Maybe because nobody celebrates it. National Doctors’ Day is held every year on March 30th in the United States. It is a day to celebrate the contribution of physicians who serve our country by caring for its citizens. The first Doctors’ Day observance was March 30, 1933 in Winder, Georgia. Eudora Brown Almond, wife of Dr. Charles B. Almond, decided to set aside a day to honor physicians. This first observance included mailing of greeting cards and placing of flowers on graves of deceased doctors. On March 30, 1958, a resolution commemorating Doctors’ Day was adopted by the United States House of Representatives. In 1990, legislation was introduced in the House and Senate to establish a National Doctors’ Day. Following overwhelming approval by the United States Senate and the House of Representatives, on October 30, 1990, President George Bush signed S.J. RES. 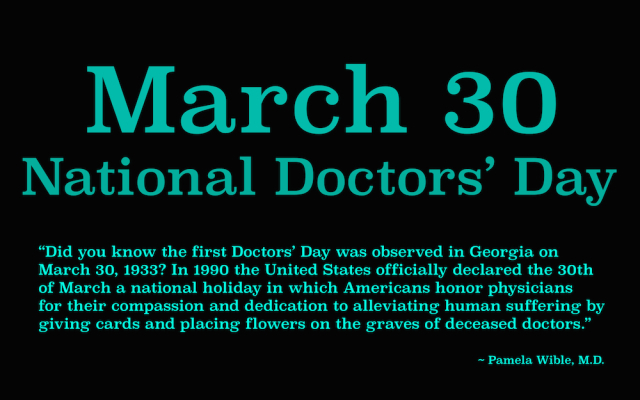 #366 (which became Public Law 101-473) designating March 30th as National Doctors’ Day. So today PARAthyroid PEEPS want to celebrate National Doctor’s day! Specifically we want to recognize all of the surgeons at the Norman Parathyroid Center where we had our adenomas removed. NPC’s commitment to their patients is unwavering. Without them our lives would be very different – we would still be suffering from the devastating symptoms of hyperparathyroid disease. Instead, our quality of life has drastically improved and our futures are bright. For this we are eternally grateful.